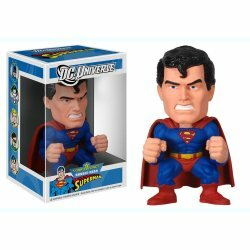 MyMovieMonsters.com > Bobbles-Vinyl > Funko > Funko Force Vinyl Figures > Funko Force DC Universe SUPERMAN Bobble Head - Rare! Add the Man of Steel to your collection with this DC Universe Superman Funko Force Bobble Head. Now very hard to find! Bobbing-head Superman 6-inch figure is sculpted in resin with moveable arms for posing. A great addition to your DC collection! Also available are the Funko Force DC Universe Joker and Aquaman Bobble Heads.